“What should take preference: the laws of society or the tenets of a religion? When should a child be granted permission to make 'adult' decisions? Do beliefs trump facts? 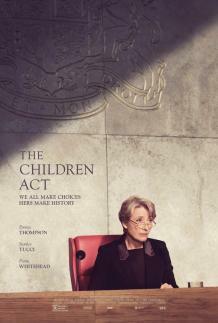 In this smart adaptation of Ian McEwan’s 2014 novel of the same name, Emma Thompson plays a British High Court Judge tasked with rendering a decision with, literally, life and death consequences: whether a 17-year-old Jehova’s Witness (Fionn Whitehead) should be forced to receive a blood transfusion, against his will, that will potentially save his life.